Emily from Winston Salem, NC ordered this unique custom design for her baby shower. The cake flavor was white with cheesecake mousse filling, yummy! The cake was decorated with our hand made marshmallow fondant. We nicked named it the peek a boo cake. She emailed us the baby shower invitation and wanted the design and colors to match. Bringing all of the design ideas together makes for a wonderful baby shower. These cakes are the most fun to make! Design something unique, just for you...or them! ”Hi, Stephanie! I hope you've had a great week. 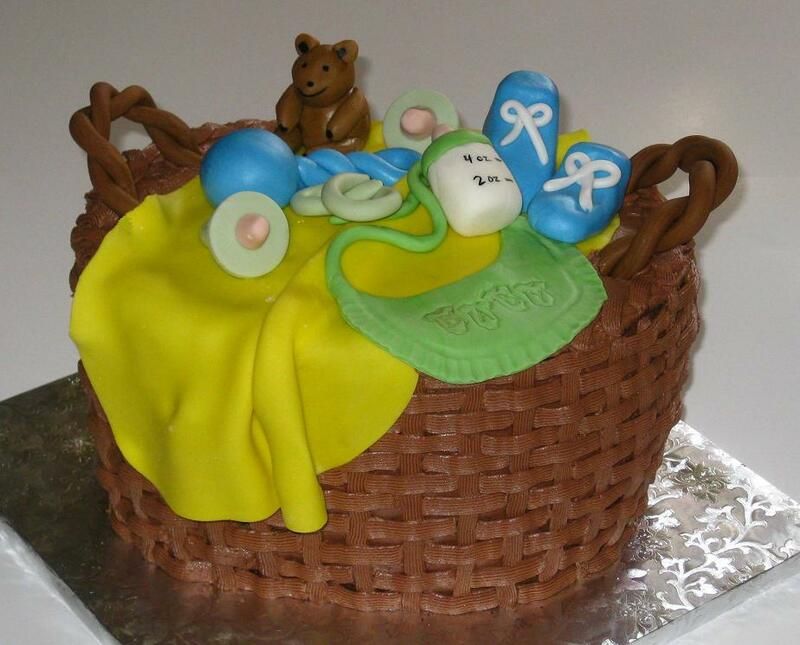 Your baby shower cake "basket cake" was the"piece de resistance" of the baby shower! People raved and raved about it and no one wanted to cut it when the time came. I can't thank you enough for helping me to make these occasions so special. Kim U. of Raleigh who is one of our frequent cake clients ordered this basket cake. Kim was hosting a baby shower, along with other friends and e-mailed a picture of a baby shower cake she wanted me to recreate. The cake flavor was chocolate with chocolate butter cream icing and a layer of raspberry preserves, covered with chocolate butter cream to create that basket weave look. All of the decorations were edible. Thanks Kim and I look forward to our next cake project! Here are some fabulous decorating ideas for baby shower and baby shower centerpiece ideas. 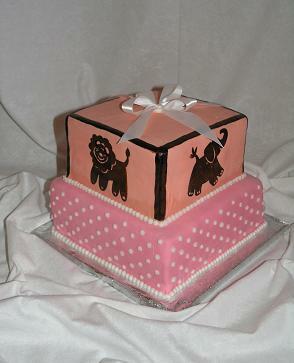 Paige A. from Raleigh ordered this pink baby shower cake. The shower party colors are this lovely pink, green and white. The cake flavor was vanilla with butter cream icing, covered and decorated with marshmallow fondant. We topped the cake with a baby basinet. 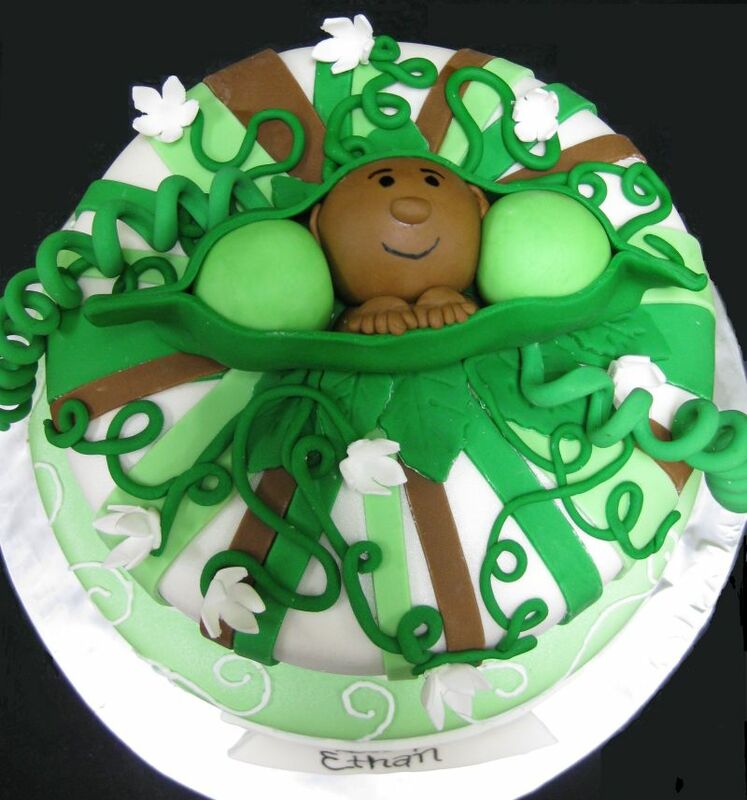 Cakes can be made to resemble anything creative that has to do with the arrival of the new baby such as baby furniture or favorite classic baby toy. Play the movie below and hear why girls just want to have fun! This baby shower cakes bottle is made with candy melts. 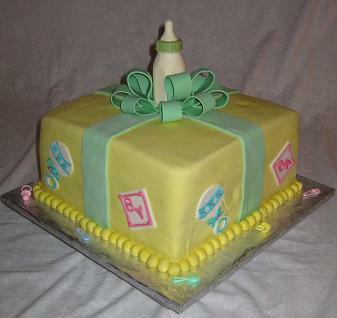 Tiffany S. of Raleigh ordered this baby shower present cake for her friend that she was hosting a party for. The cake flavor was vanilla and covered with marshmallow fondant. The bottle is edible and the fondant bow is made from a mixture of gum paste and fondant. 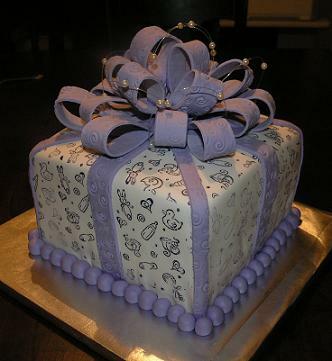 The expectant mother’s best friend ordered this stamped lavender cake. The shower cake flavor was vanilla with butter cream and yummy raspberry filling. The bow that topped the cake was handmade with marshmallow fondant. Helen B. of Raleigh ordered this baby shower cake with a pregnant lady cake topper. The cake flavors were chocolate cake with butter cream icing and a layer of raspberry preserves covered in marshmallow fondant. 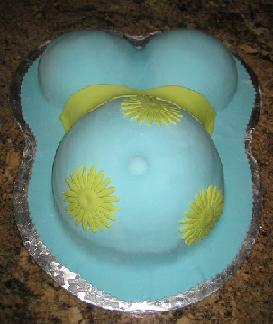 The pregnant lady sitting on top is edible and made with marshmallow fondant. Sarah A. from Fuquay Varina ordered this baby shower beach theme cake with a special sea turtle on top for her friends baby shower. The mom to be loves sea turtles and has the baby’s room decorated in a beautiful sea turtle theme. It was hand painted by the grandma to be and she did an AMAZING job! 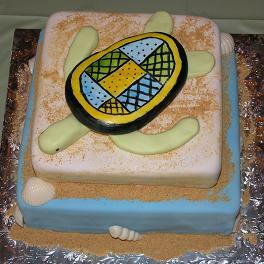 This beach theme baby shower cake was lemon flavor with butter cream icing and a layer of raspberry preserves. The cake covered in marshmallow fondant. 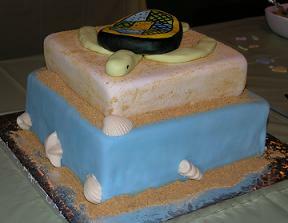 The sea turtle was made from a mixture of gum paste and fondant. The seashells were vanilla candy melts and the sand is graham cracker crumbs. This baby shower zoo cake had lions, tigers, and bears, oh my! The colors were to match the bedding that the mother to be had decorated the baby’s room in. The cake flavors were vanilla with butter cream icing and covered in marshmallow fondant. The animals were stamped on with gel food coloring. Design something unique, just for you...or them! Whether you are decorating with expensive or discount baby shower supplies and invitations, use them to inspire your baby shower cake. 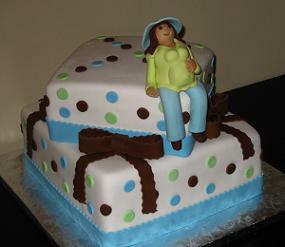 Diane from Knightdale ordered this carriage cake for a baby shower she was hosting. The flavor is vanilla with butter cream filling/icing, covered in marshmallow fondant topped with a baby carriage. 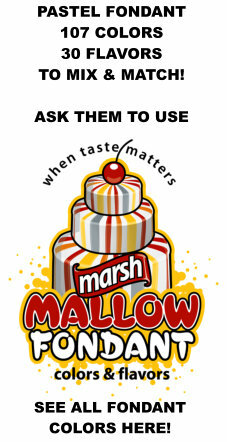 The design possibilities are unlimited and are available in all flavors, fillings, frostings, and sizes. 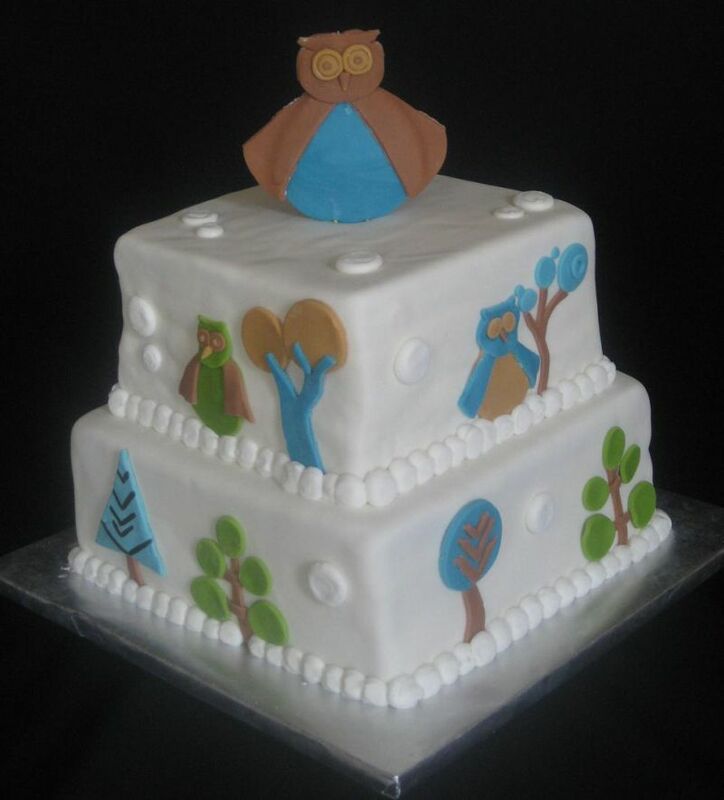 When you plan your next baby shower let Piece A Cake make you a unique and delicious one-of-a-kind baby shower cake for that special mom to be! This was a Mom and Dad baby shower. The baby shower event was held at Rudinos restaurant near the RTP and I40 in Durham. 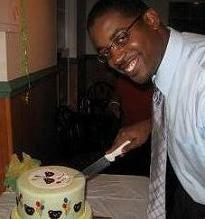 The cake was butter flavored with butter-cream icing covered in marshmallow fondant with teddy bears stamped using edible ink. The balloons were fondant cutouts. The Dad cut the cake and did the job quite well! All of my family lives in the Pensacola, Fl area so when ever I can get away, Florida is where we go! This cake was made for my cousin Amanda. She is having a boy and put me in charge of the style and color of the cake for the baby shower. She did not want the traditional, pink, blue and yellow, so I colored the fondant in the blue, green and brown color scheme, the more modern colors. At the baby shower, everyone commented was how beautiful it was. They also keep saying how deliciously moist it was. What can I say, my granny taught me! Amanda did not want to cut it when it came time! Her and her mother made sure they got plenty of cake pictures. One comment from her Dad was “It almost looks like plastic”. I love it when my cake clients tell me what the scheme of the party is, how many servings, and trust in me to bring it out in the cake decorating ideas! Since the top tier of the cake was not cut, Amanda had decided to freeze the top piece and open it for his first birthday, what a cool and wonderful idea! The baby shower cake should make that Mom to be, feel special and unique. These cakes are designed to do just that. What better way to express your love than to give that special person a unique cake that tastes great too! These special cakes are made to celebrate both the Mom and baby. 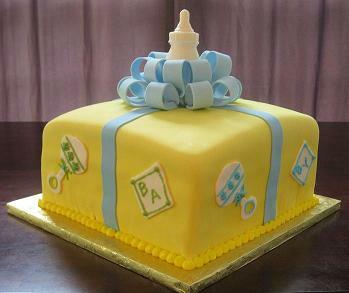 Cakes for baby showers are charming to see and at Piece A Cake are delightful to eat! The happy event of a baby shower allows for creativity, fun and entertainment. 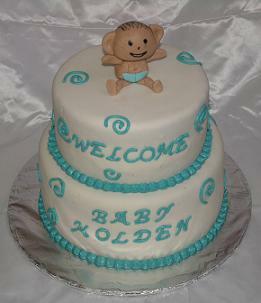 The baby shower cake serves as a great centerpiece during the party and delicious dessert thereafter. Most of our cake design ideas come from our clients. 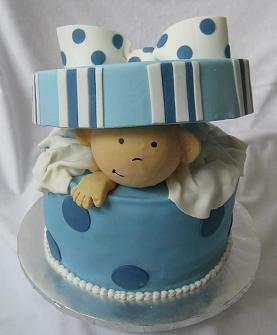 This onesie baby shower cake was for baby Darden. Welcome baby Darden! May all of your days be filled with joy! My good friend "Chef Deb" has some great menus for baby showers. I highly recommend that you view her site Chef-Menus.Com for some great ideas for planning your next baby shower, or really, any event that involves cooking! This rubber ducky cake flavor was vanilla topped with rubber ducks swimming in a rich blue foamy sea of butter cream icing! 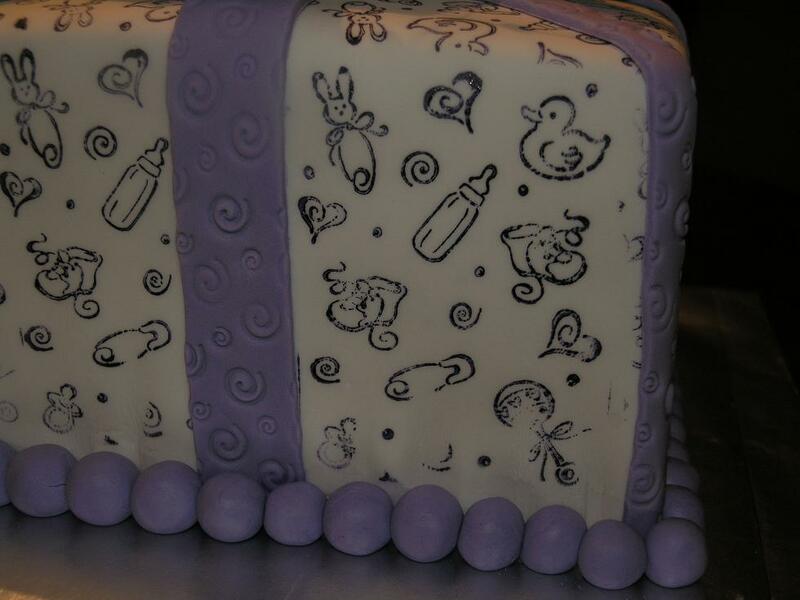 This baby showers cakes bottle is made with candy melts, yummy! Kristina W. from Creedmoor, NC ordered this beautiful baby shower cake. The flavor was vanilla with butter cream icing covered and decorated with our hand made marshmallow fondant. The bow was also made using a little gumpaste mixed with fondant to help it harden. 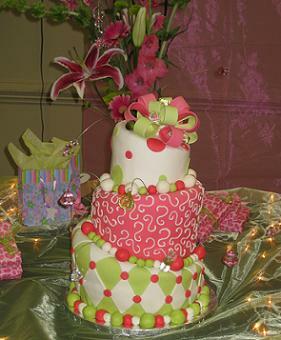 If you have a cake idea; send it and let us bring your cake into reality. This fondant baby shower cake was chocolate and white flavored. The topper was a plastic (non-edible) baby carriage. It was covered and decorated with delicious hand made marshmallow fondant. Pamela ordered these baby shower cakes. The baby shower theme was safari. The cake flavors were vanilla and yellow with butter cream icing covered in fondant. The animals were stamped using a stencil and food coloring. The bottle was made from vanilla candy melt. The smaller cake was made for the parents-to-be who are Vegetarians so I specially made a vanilla vegan cake for them to enjoy. 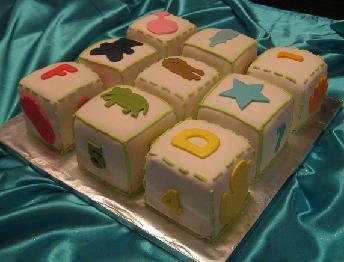 The baby block cakes were actually nine square cakes covered and decorated with hand made marshmallow fondant. They were flavored marble with buttercream icing. We used the baby shower plate for the color and theme and added Welcome Baby Holden! May your life be blessed! 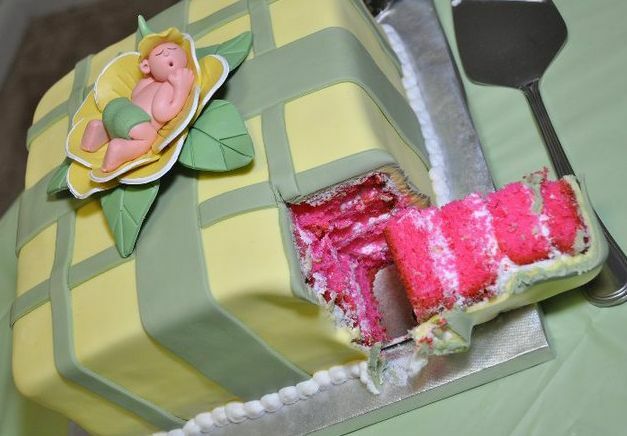 This baby cake has a fondant baby on top. Its bottom layer is French vanilla with cream cheese frosting and the top layer is chocolate cake also with cream cheese filling. 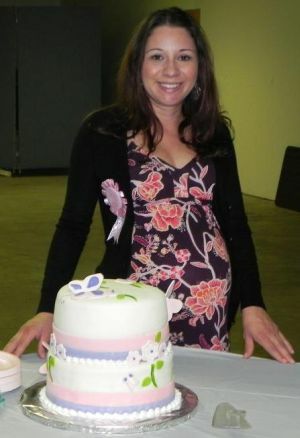 A wonderful and loving lady named Joy ordered this baby shower cake for her special mom-to-be friend. We based the style and color theme on the swatch she e-mailed. The colors were pink and chocolate and used fondant to wrap it up like a present. The rocking horses were used for the cake topper. Welcome Mya! May all of your dreams come true! The cake colors are constantly changing. The modern colors that are popular these days are blue, brown, and green. 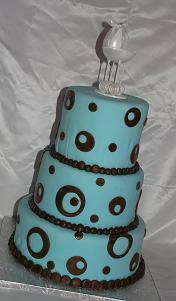 This blue brown cake was flavored chocolate with butter-cream icing covered with fondant and decorated with fondant cut out circles. 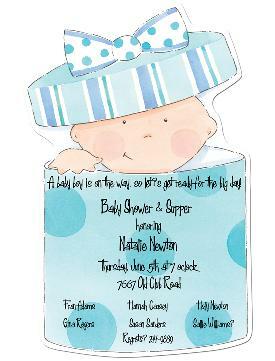 Visit our friends at Inspiring Birthdays for free downloadable baby shower invitations plus unique ideas for the hostess. Also see invites and gift ideas for all the major birthdays. 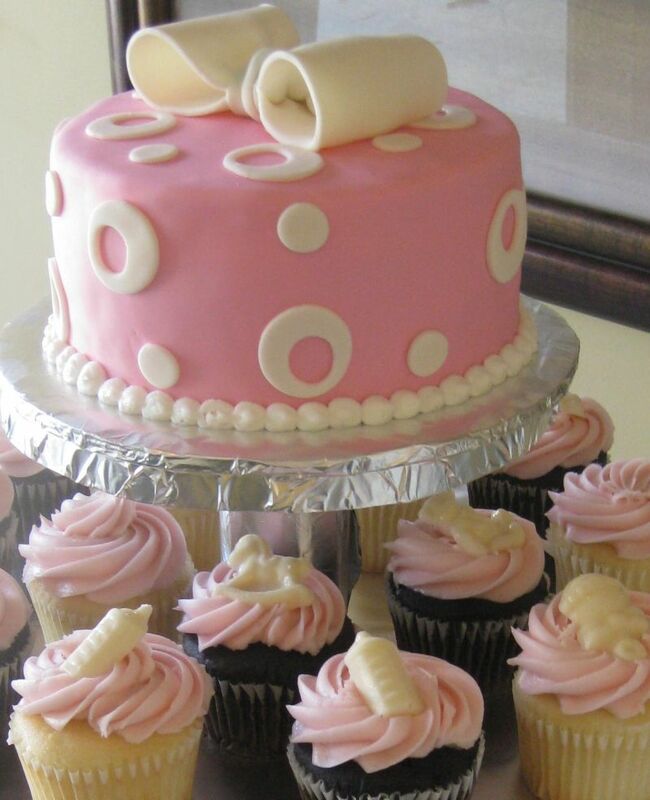 These baby shower cakes were ordered by the grandmother to be for the party she was hosting for her daughter. The baby shower cake and cupcakes flavor was white cake, topped with chocolate butter cream and finished with a fondant bear. 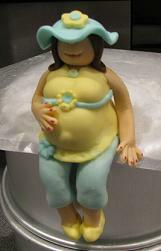 The pregnant lady baby shower cake topper is also hand made with marshmallow fondant. Baby shower cupcakes are an economical way to have a very beautiful cake presentation that's easy to serve. Add some baby shower cupcake toppers like, bears, bottles, rocking horses, rattles, and more in a varity of colors to match your baby shower theme. ”Stephanie, I want to THANK YOU so very much for the cupcakes you made for my daughter's baby shower. They were wonderful, and absolutely delicious. Everyone was raving about how nice they were, and of course, how well they were displayed." This lady bug cake was ordered by Amy P. from Garner, NC. It was for her good friends baby shower. Her theme was ladybugs. Mrs. Lady Bug was made from vanilla cake with butter cream icing and strawberry filling, covered in marshmallow fondant. The ladybug was only for the mother to be. The guest enjoyed the baby ladybug cupcakes. 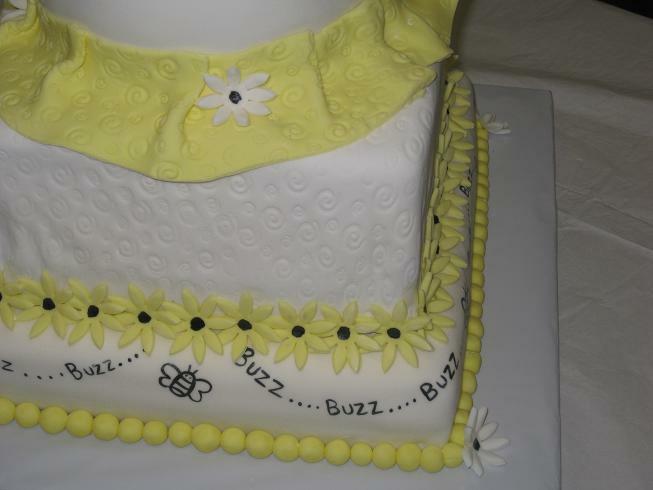 This bumblebee cake theme was made for a friend of a friend’s baby shower that the lady’s of the church were throwing for her. 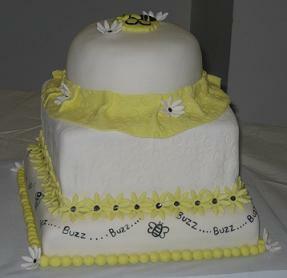 It was yellow cake with butter cream icing covered in marshmallow fondant with hand painted bees and gum paste daisies. We invite you to see Our "Fresh Out of the Oven" Cakes. We just made these! 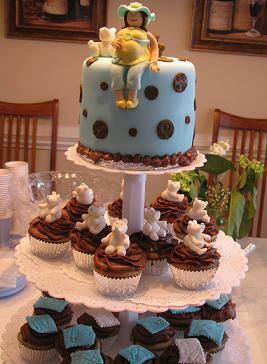 Aisha of Knightdale ordered this blue brown baby shower cake for one of her very good friends. The cake was French vanilla with butter cream icing covered and decorated with marshmallow fondant. 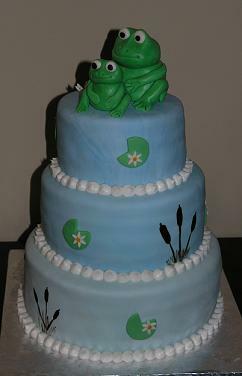 Paula from Raleigh ordered these baby shower cakes with a frog theme. The cakes were almond and butter cream icing covered with marshmallow fondant. 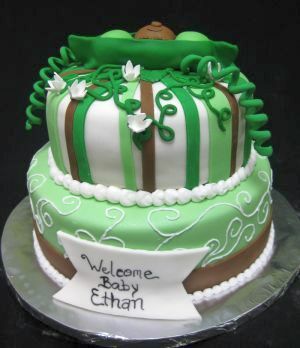 All of the decorations on these baby shower cakes are edible, even the frog that is hand made using fondant. This is a frog baby shower cake that was ordered by Michelle O. from Willow Springs. The flavor of the frog cake was yellow and butter cream icing covered in marshmallow fondant. 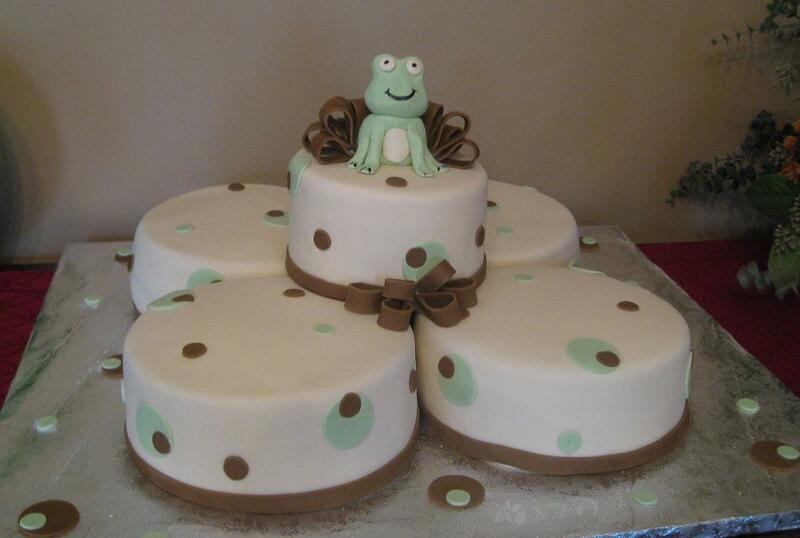 Decorated with fondant lily pads, daises, and mom and baby fondant frogs. Amazing Baby Shower Ideas Free baby shower ideas available right here! You'll find free printable baby shower cards, shower games, even your baby shower menu, all in your chosen theme! I have attached a few pictures before and after for your viewers to enjoy! 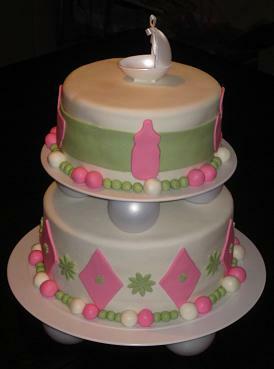 Krystl from Raleigh, NC ordered this beautiful mad hatter cake for a baby shower. I love the colors on this one! 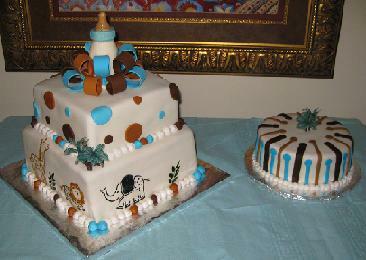 The baby shower cake flavors were vanilla with butter cream icing and chocolate with chocolate butter cream. All covered with marshmallow fondant topped with a gum paste fondant bow and we added some hanging “bling” around the mad hatter cake. Alice in Raleigh, NC ordered this baby bump cake for her friends baby shower. The flavor was carrot cake with cream cheese icing covered with marshmallow fondant and fondant daisies. And yes, she had an out-ie! Elizabeth emailed me a theme print from Dwell Studio to match. The cake flavor was lemon buttercream with raspberry filling. Yummy! ”Hey Stephanie. My butterfly baby shower cake was wonderful! Thank you so much, everyone loved it and I have to say the marble cake with the chocolate mousse was my favorite! 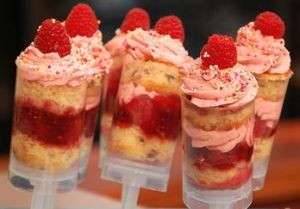 The cake flavor was marble with chocolate mousse filling and French vanilla with buttercream and raspberry filling, yummy! This pea in a pod cake flavor was French vanilla and red velvet with whipped icing...yummy! Are you looking for that Unique baby shower gift, or just a gift to spoil that special grandchild? Visit Unique-babyshower-gifts.com and check out the Sacco Bambino™ Collection and more! Do you want to be the star of the baby shower with the best baby gift ever? Visit make your own baby stuff.Com to get some great baby shower gift ideas!